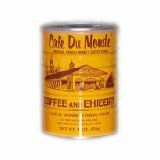 Cafe Du Monde Coffee & Chicory Buyers Guide. Coffee by Cafe Du Monde. Items include several sizes of Coffee & Chicory, and French Roast Coffee. Coffee made with chicory flavoring. Each decaf can is 13 ounces, regular is 15 ounces. Rich blend of dark roasted coffee with chicory. The decaffeinated blend is made using the ethyl acetate process for decaffeinating. Ethyl Acetate is found in fruits and is a natural chemical. This blend has been served at a popular New Orleans landmark, the Cafe Du Monde in the French Quarter on Decatur Street. They are found serving year round and 24 hours a day café au lait and hot beignets. They have also located more locations in the greater New Orleans metro area, and throughout Japan. The only day they are closed is Christmas Day.